In Advertising > Souvenirs > Show & Tell. This is a 1950's travel decal which could be used for applications on glass (car windows), metal, wood, or other hard surfaces (suitcases). There is a cellophane type cover sheet to protect it from being scratched before use; it has been removed but has adhered to the color print because of age. 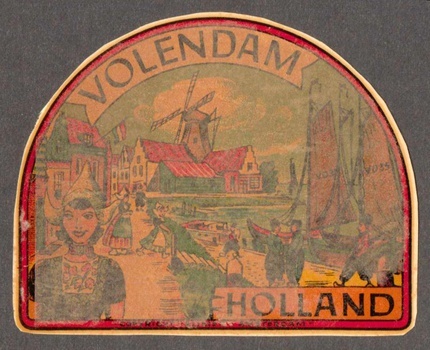 Volendam (literally: Filled Dam) is a town in North Holland in the municipality of Edam-Volendam. In the early part of the 20th century it became something of an artists' retreat, with both Picasso and Renoir spending time here. Volendam is a popular tourist attraction in the Netherlands well known for its old fishing boats and the traditional clothing still worn by some residents. The women's costume, with its high, pointed bonnet, is one of the most recognizable of the Dutch traditional costumes, and is often featured on tourist postcards and posters (although there are believed to be fewer than 50 women now wearing the costume as part of their daily lives, most of them elderly).